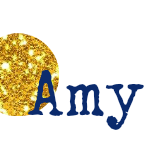 I love blogging clubs, so today, I’m joining a few of my blogging friends in the Blogger Clue Society! In this club, participants cook from an assigned blog for a themed reveal each month (and the club is open to new members! If you are interested comment below or e-mail me and I’ll get you in touch with the right people!) 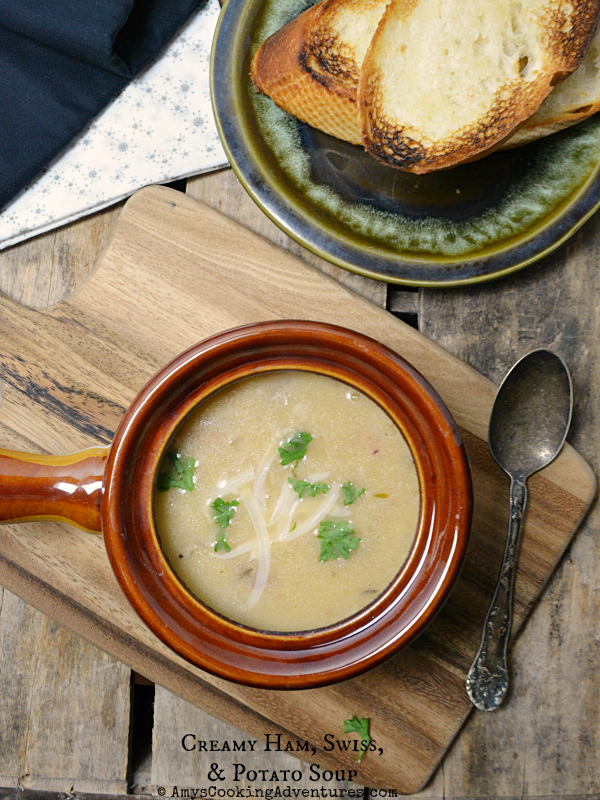 Since February is the height of the cold, winter blahs, we’re cooking up warm, comforting soups and stews today. For today’s recipe, I got to choose from one of the many delicious recipes from Kathy’s blog, A Spoonful of Thyme. Kathy remembers watching her grandmother and mother cooking when she was young. After she had her own children, she also began cooking and placing great importance on family meal times. I couldn’t agree more! We have dinner as a family (usually home cooked) every evening – it’s pretty rare that one of us can’t make it (especially since my kids are still little)! Kathy has so many delicious recipes to choose from, including numerous soups! I seem to always gravitate toward potatoes and cheese this time of year, because my list included Dutch Cheese Soup, Potato, Cheese, & Ale Soup, Roasted Potato Leek Soup, and my final choice: Creamy Ham, Swiss, & Potato Soup. I was so happy I chose this soup! I even made the cheater version with deli ham because I overbought at the store. I can only imagine how much more delicious it would be with baked ham!! WOW! There is a perfect balance of flavors. There’s smoky flavor of the ham, mixed with the creaminess of the potatoes, and sharpness of the Swiss cheese. It is absolute perfection and a wonderful way to warm up on a cold winters day! Thank you for such a cozy recipe, Kathy! Melt the butter in a small soup pot over medium heat. Add the onions and ham. Cook, stirring occasionally until the onions are softened and the ham is lightly fried. Stir in the thyme, potatoes, and chicken stock. Bring to a boil, then cover and reduce heat to a simmer. Simmer for 20 minutes or until the potatoes are soften and easily broken up. Use a spoon to break up some of the potato chunks. Stir in the cheese and milk and heat through. Season with salt and pepper. Serve with a sprinkle of parsley and Perfect Garlic Toast. I'm glad that you liked the soup, Amy. In my book, any soup with potatoes and cheese is a good one! Thank you for the kind words. Potato soup is always so good with cheese, and the ham makes it a meal! Great weeknight meal. Kathy does have great recipes. Most excellent choice for this month's theme. That's a bowl of pure comfort food right there! I'm sure the deli ham was delicious, but I agree with you; it would be doubly amazing with chunks of baked ham. It still looks fantastic. 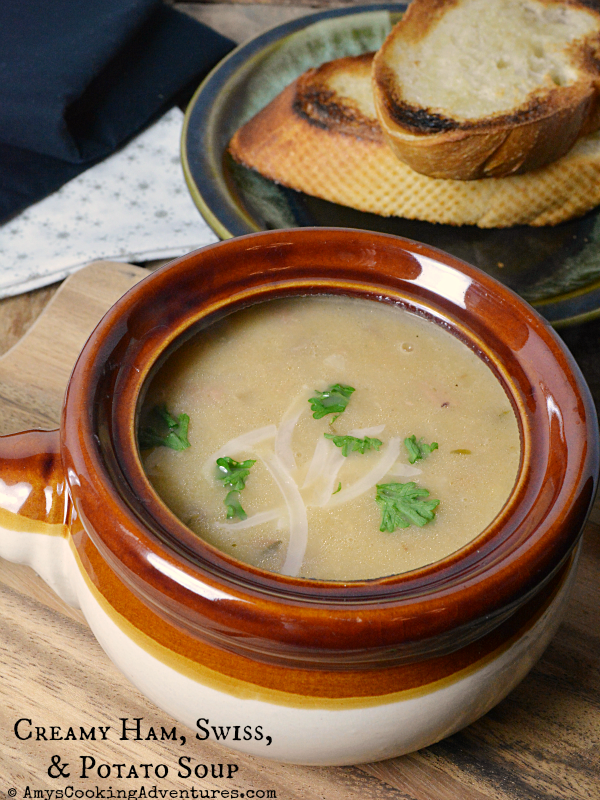 What a PERFECT soup for the chilly winter nights! Delish! I've never thought to use extra deli meat in soup!